I have this painting sitting beside my desk. It’s small and inconsequential. It’s also not finished. This 10 x 10″ canvas is plaguing me. I’m tempted to box it up and shove it in a dark corner in the back of one of my closets. I’m not sure when I began to feel hostility towards the painting, but it’s there now. Don’t get me wrong. The painting hasn’t slighted me. It didn’t forget to call when it said it would. It didn’t spit in my eye. It didn’t look at me as I passed wearing a new dress and say, “That’s a bit tight, isn’t it?” No, the painting hasn’t done anything except not live up to my standards, and in that respect, I cannot fault the painting as much as myself. Yes, OK, I’m mad at myself. Does that make you feel better now? You’ve winkled it out of me. I’m disappointed in myself for the expectations I haven’t met with this latest work. My God, it looks like I’ve painted it with my toes, whilst blindfolded and three sheets to the wind. Grrr. But whether I get around to doing it is another matter entirely. 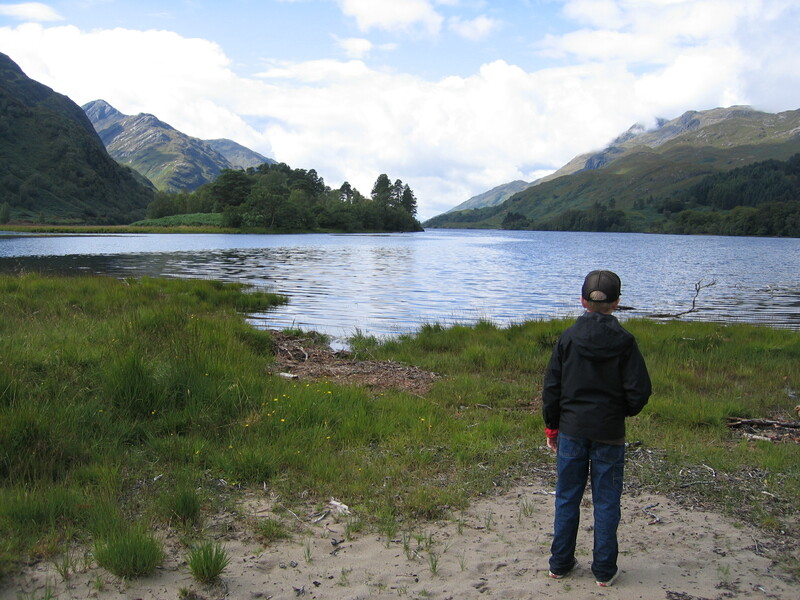 That’s my youngest, by the way, at Loch Shiel (Harry Potter’s “Hogwarts” location) in Glenfinnan, Scotland. Anyhow, the latest canvas sits and mocks me with its unfinished edges, its rudimentary lines, I’ve even decided I don’t care for the colors. I’m really displeased with myself – and that, right there, is the problem. I’ve not sat down and told myself what I’d tell anyone else in my place, “Just do the best you can” or “Why don’t you put it away for a while and then come back to it with a clear head?” Is that human nature, do you suppose – to be so hard on ourselves, and yet so loving to others? This painting is for someone I haven’t met in person. Someone I only know virtually. Someone who has gone through some pain this year. I was hoping the simple act of creating this for them would take some of that pain away, and let them know someone out there empathized with them. Instead, I’ve made a mess and haven’t accomplished anything. It looks as if I’ve given the brush and paints to a temper tantrum prone toddler after shutting off the TV in the middle of a Dora the Explorer episode. I’m talking epic fit. Alternatively, think moose locked in a small space with a brush attached to its antlers. That’s how bad it looks, OK? Be that as it may, I don’t like quitting. When I get this tenacious, my eldest boy calls me “DOS Lady.” It stems from an episode when he was in 4th grade and I was trying to load a game for him on the computer but it kept slipping into DOS mode. Hours later he’d given up and wandered off, while I sat at the computer screaming a blue streak and damning every part of it to a fiery ever after. “NO! I won’t! It says to do this and I’ve done this so I don’t understand why the bloody thing won’t bloody work when it says it’s supposed to. What’s wrong with it? Why won’t it work? !” I wailed for the umpteenth time. Will this be my DOS Lady painting? My DOS Lady swan song? Who’s to say. All I know is when I’m done, I’ll have set out to do something kind, and given my best, and that’s all I can ask of myself.